The ShowEdges command highlights naked, non-manifold or all edges of the selected surface and mesh objects. The edges highlight and the ends of edges are marked with point display markers in the color you selected. Displays all surface, polysurface, and mesh edges. 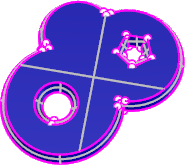 Displays open edges in surfaces, polysurfaces, and meshes. 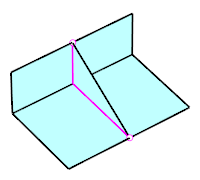 A surface, polysurface, or mesh edge that is not connected to another edge. Solid objects have no naked edges. Displays edges of polysurfaces or meshes that have more than one face joined to a single edge. Zoom to include the selected edges. Zooms to include all naked edges. Zooms to the first edge in the selection. This useful if you zoom out with the mouse and want to zoom back in. Zooms to the next edge in the selection. If the selected objects have only one naked edge, this option is not displayed. Zooms to the previous edge in the selection. If the selected objects have only one naked edge, this option is not displayed. Marks the ends of the edge with point objects. If the All option was previously selected, all naked edges are marked. Sets the display color for the edges. Adds objects to the edge display. Removes objects from the edge display. The ShowEdgesOff command turns off edge display and closes the Edge Analysis control. The ZoomNaked command finds and marks naked edges. The active view zooms to display the first naked edge. Zooms to all naked edges. Zooms to the current naked edge. This useful if you zoom out with the mouse and want to zoom back in. Zooms to the next naked edge. If the selected objects have only one naked edge, this option is not displayed. Zooms to the previous naked edge. If the selected objects have only one naked edge, this option is not displayed. Marks the current naked edge by adding point objects at each end. If the All option was previously selected, all naked edges are marked. The ZoomNonManifold command finds and marks non-manifold edges on selected objects. Zooms to all non-manifold edges. Zooms to the current non-manifold edge. This useful if you zoom out with the mouse and want to zoom back in. Zooms to the next non-manifold edge. If the selected objects have only one naked edge, this option is not displayed. Zooms to the previous non-manifold edge. If the selected objects have only one naked edge, this option is not displayed. Marks the current non-manifold edge by adding point objects at each end. If the All option was previously selected, all non-manifold edges are marked.